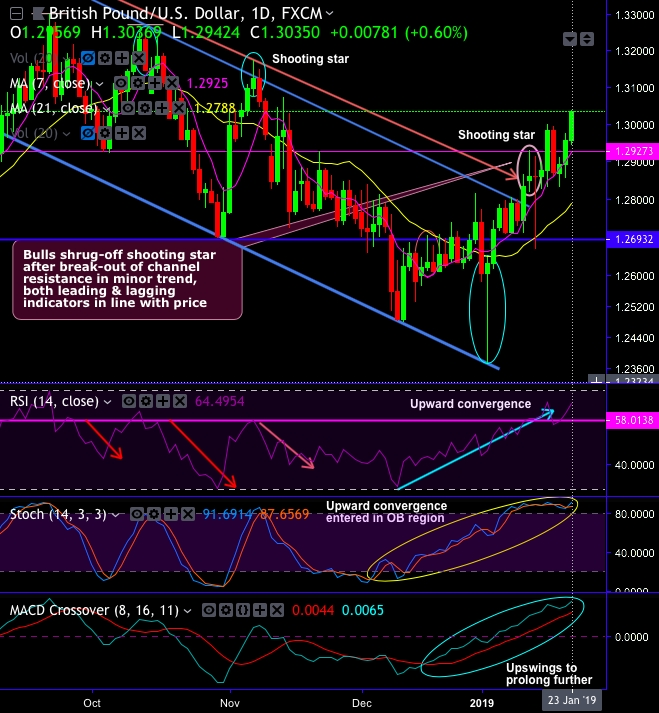 Technical chart and candlestick patterns of GBPUSD (cable): The minor trend was traced out in the sloping channel. Cable’s current price has rebounded from the lows of 1.2476 region on hammer occurrence at channel support (the pattern has occurred at 1.2632 levels), the upswings are in conformity to both the momentum and trend indicators. As a result, the trend has broken-out channel resistance of 1.2809 levels. Shooting star patterns also popped up at 1.2861 and 1.3755 levels on daily and monthly plotting respectively. Bulls, for now, have shrugged-off shooting star after the break-out of channel resistance in the minor trend. Nevertheless, 1.3125 level is still perceived as the major barrier ahead of 1.3209 (i.e. 21-EMAs). As stated in our previous post, as RSI managed to break-out stiff resistance of 58 levels where it showed faded strength in the recent past, intraday bullish momentum risks a sharper test of pivotal resistance in the 1.3073 region. On a broader perspective, we foresee the resumption of major downtrend after momentary consolidation phase, slumps below EMAs are observed upon shooting star formation (refer monthly plotting). For now, the trend is on the verge of retracing 61.8% or even more 78.6% Fibonacci levels as both leading and lagging indicators in tandem with selling sentiments & bearish EMA crossover in this timeframe. Both leading (RSI & Stochastic curves) and lagging (EMAs & MACD curves) indicators signal weakness of this pair. While the USD is on the back foot, which may limit the downside in the near-term. Trade tips: On trading perspective, at spot reference: 1.3031 levels, contemplating above explained intraday technical rationale, it is advisable to trade one-touch call option strategy using upper strikes at 1.3054, the strategy is likely to fetch leveraged yields as long as underlying spot FX keeps spiking further up to upper strikes on the expiry duration. Alternatively, on hedging grounds, we maintain our shorts in the futures contracts of mid-month tenors that were advocated earlier, as the underlying spot FX likely to slide southwards 1.26 levels in the medium terms. Currency Strength Index: FxWirePro's hourly GBP spot index is inching towards 82 levels (which is bullish), while hourly USD spot index was at 61 (bullish) while articulating (at 13:12 GMT).